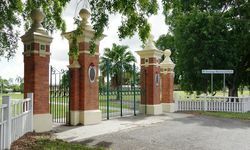 The gates were erected by the women of Stephens Shire to commemorate the men from the Shire who fought in World War One. The Stephens Shire Gates on Ipswich Road were unveiled by Major S.H. Bruche on the 8th October 1921 in a preliminary ceremony prior to the unveiling of the Fallen Soldiers Memorial in Yeronga Park. Speeches were made by the Chairman, Councillor F. A. Stimpson and Mr. D. F. Denham who paid tribute to the work of the women of the shire in the task of raising funds for the memorial . The Brisbane Courier, 10th October 1921. These gates were erected by the women of Stephens Shire in honor of the men who fought for them. This tablet is dedicated to the women workers of Stephens Shire.